"The Age of Innocence," "Brokeback Mountain" and more. Based on the 1920 novel of the same name by Edith Wharton, Martin Scorsese’s “The Age of Innocence” tells the story of a respectable New York lawyer named Newline Archer (Daniel Day-Lewis) who finds himself emotionally trapped when he falls for Ellen Olenska (Michelle Pfeiffer) and not her cousin, May Welland (Winona Ryder), to whom he is engaged. In the midst of his marriage to May, Archer’s love for the Countess Olenska grows as he becomes more and more attracted to her independent values and unconventional views. Currently in the in the process of divorcing an abusive and unfit husband, Olenska has become a pariah in high society circles. Despite being somewhat of a step away from the norm for Scorsese, “The Age of Innocence” still has distinct elements of his style and writing. Beautifully shot by Michael Ballhaus, this film brings 1870s New York, and the societal expectations that come with it, back to life. Keira Knightley has been the undisputed queen of romantic period pieces for the past decade (see “Pride and Prejudice” below, plus “Silk,” “The Edge of Love,” “The Duchess” and “Anna Karenina”), and her work in Joe Wright’s Oscar-winning “Atonement” not only proves why she’s become the go-to romantic period love interest, but it also ranks near the very top of her best performances to date. 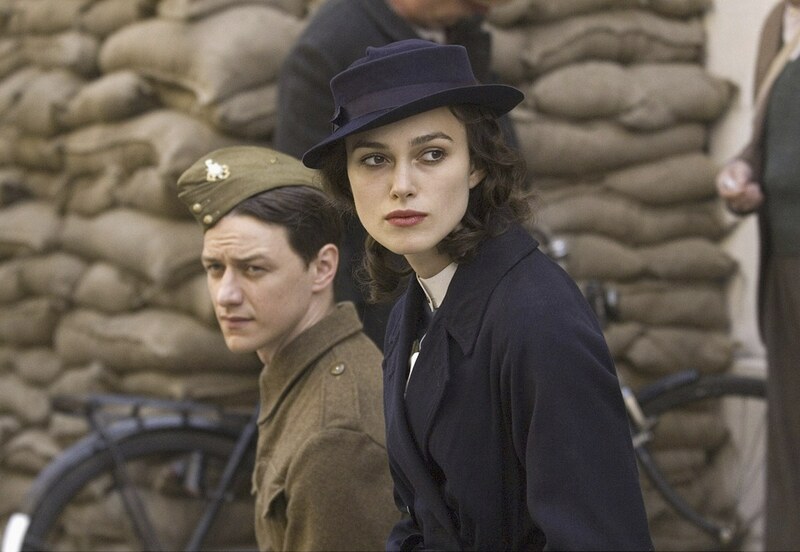 Wright may bask Knightley’s Cecilia in gorgeous halos of light throughout much of the film’s first act, but Knightley refuses to let the character become an angelic, passive love interest for James McAvoy’s alluring Robbie. While embracing Cecilia’s ethereal femininity (her poise while wearing the famous green dress is one of the film’s definitive moments of elegance), Knightley proves resolute and commanding as the world denies the two lovers the chance to be with one another. The passion between Knightley and McAvoy shows that the will to love is worth it no matter what life-changing obstacles stand in the way. Putting the chemistry that expertly grows between Ben Whishaw and Abbie Cornish aside, the real romance of “Bright Star” comes directly from acclaimed writer-director Jane Campion. As director, Campion takes the love story of English poet John Keats and Fanny Brawne and realizes it as a visual Romantic poet herself. The way the handheld camera creates intimacy between the leads and how she captures the delicate beauty of 19th Century Hampstead (a field of purple flowers becomes a simile of blooming love) is as breathtaking as it is involving. Campion’s talents also shine through in the screenplay, which transcends the cliches of a “love story” by observing the meticulous ways chemistry grows between two people. The film is one constantly evolving relationship that resonates through history, and the way the two leads navigate the seesaw desires of their characters makes “Bright Star” a definitive entry in the genre. Ang Lee’s film is arguably the first gay romance to ever break through to the mainstream culture. Based on a short story by Annie Proulx, “Brokeback Mountain” stars Heath Ledger and Jake Gyllenhaal as cowboys who fall in love while herding sheep in the summer of 1963. Transcending its label as “the gay cowboy movie,” the film had both straight and gay audiences alike lining up outside of theaters. Ledger gives an iconic performance as Ennis, infusing his character with a stoic pathos and longing. The film rightly received eight Academy Award nominations, and many cried foul after it lost Best Picture to Paul Haggis’ “Crash.” But the importance of “Brokeback Mountain” surpasses awards recognition; it proved to mainstream America that a gay romance could be just as vital, rewarding and heartbreaking as any other. Oscar-winner Ang Lee has established himself as one of the most versatile and adaptable directors when it comes to period films (see “Sense and Sensibility” below), and his millennium sensation “Crouching Tiger, Hidden Dragon” is certainly no exception. The film set records in terms of how far a foreign film could go in the United States at the domestic box office, and it put Chinese actors on the map for future American productions. Creating a tragic love story between Chow Yun-fat (“Hard Boiled”) and Ziyi Zhang (“Memoirs of a Geisha”) that unfolds during the Qing Dynasty in 19th century China, the film dazzles on both a personal level and an eye-popping visual one. Lee’s ability to maintain focus on the relationship between his stars within such an epic scope contributes immensely to the film’s watchability and cements his status as a filmmaker who knows how to successfully integrate style and substance for dramatic effect.